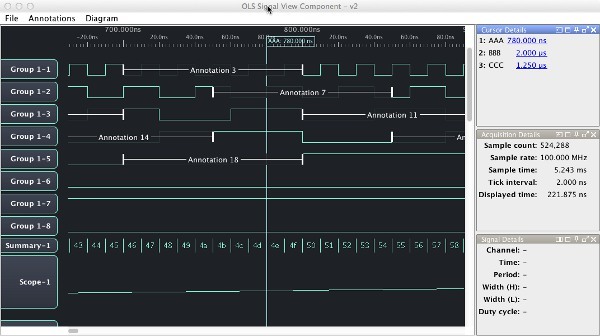 Jawi uploaded a preview of the new signal display component for the Logic Sniffer application. OLS is a java client designed to run on multiple platforms including Windows, Linux, and Mac. You can download this mock from ols.lxtreme.nl, which should run on Windows, Linux and OSX (only the latter is heavily tested ;)). cursors can now be placed in ‘snapped’ to a signal edge. cursor, measurement and acquisition information is now presented in separate windows that can be docked/undocked/moved at will. Via and Source: Dangerous Prototypes.